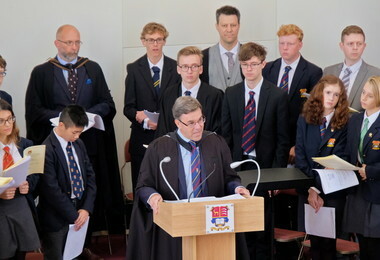 Sunday 23rd September 2018 marked Founder's Day; during the academic year 2018/19 we will be celebrating 150 years of Bishop's Stortford College. 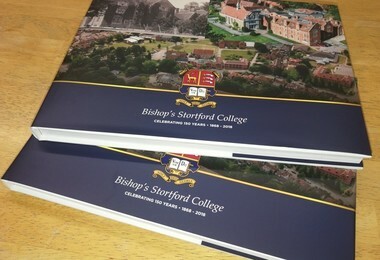 The History of Bishop's Stortford College, a 196 page hard backed book, is now available, with the official launch taking place at our Festival of Literature when copies will be available to collect. 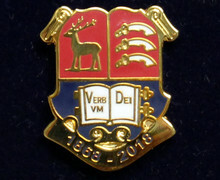 We will print a limited edition of just 800 copies, priced at £34.50. To buy a copy, please click the link here. A taster of the content is below. Please note, if you wish the book to be mailed to you, there will be an additional postage and packaging charge of £6.50 (UK mainland), £11 f(EU) and £17.65 (rest of the world). 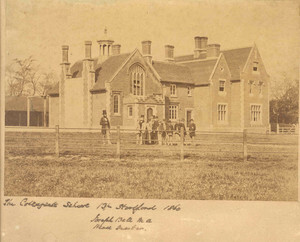 Much has changed since 1868 but we still use the original school building School House, which is currently undergoing a transformation into our new administrative hub, additional classroom facilities and Senior School Staff Common Room. Today, we enjoy outstanding facilities across our 130 acre campus, some of the best boarding accommodation in the region and are consistently placed in the top 20 co-educational independent day and boarding schools in the UK. What hasn't changed is our desire to share with our immediate College community and more broadly with the community of Bishop's Stortford and surrounds. During our sesquicentennial we will be holding a number of events for pupils, staff, parents, Old Stortfordians, Governors and the wider community. We aim to share our wonderful facilities, celebrate our achievements, develop further our relationships with our fellow member schools of the Bishop's Stortford Educational Trust and share our celebrations with the community at large. On Sunday 23rd September 2018 we commemorated Founders’ Day and celebrated our 150th anniversary with a Service of Thanksgiving in the Memorial Hall. 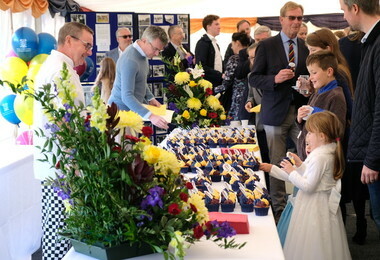 Current families and Old Stortfordians were invited to mark this special occasion in the College’s history. 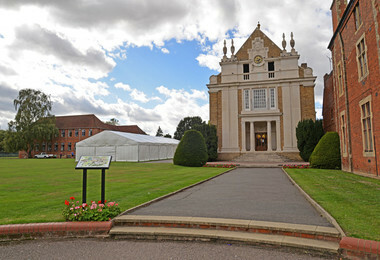 After the service, refreshments and birthday cake were served in the marquee next to the Memorial Hall. On Monday 24th September the whole College community came together for the annual Charity Day, which this year raised money for OneYMCA. Pupils from all sections of the College took part in a huge flash mob dance to the iconic song YMCA by Village People, with Prep and Senior School pupils dancing on Middle Green and Pre-Prep pupils hosting their very own dance off. 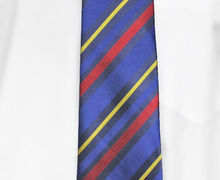 Pupils, staff and Old Stortfordians are now able to purchase commemorative pin badges (£8) and our special edition ties (£13) from the School Shop. An outline of some of our celebratory events is below. Time Capsule Event - planned by all three sections of the College, the contents of our Time Capsule will illustrate life at the College in 2018. The time capsule was buried at 11 am on Masters Green and will be reopened in 2068. 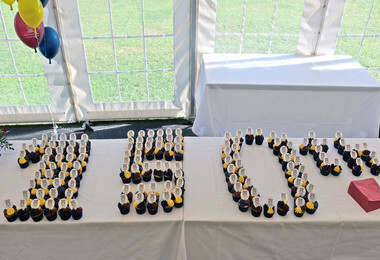 A selection of trees were planted across the campus to mark our 150th. 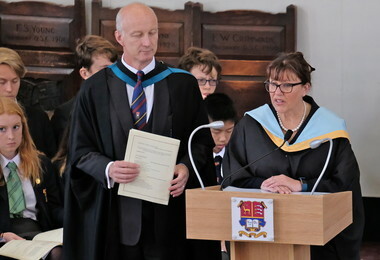 The Lord Lieutenant of Hertfordshire visited the College. We aim to give an insight into our strengths, our facilities and include fellow BSET schools in the day. With special emphasis on the ending of WW1 and the loss of so many lives, including those from the College community, we reflected on this conflict and others since with services for all sections of the College. Supporting our local branch of the Royal British Legion we laid a special wreath at the town War Memorial on behalf of the College community. At noon we hosted a lunch attended by the Headmaster, Prefects and leaders of the local community. Senior School dramatists performed a specially commissioned musical to celebrate our educational values and progress through the last 150 years. Running alongside our 10th Festival of Literature, we hosted a celebration of visual creativity by staging an exhibition of some of the finest work from recent years from all sections of the College. Our annual celebration of the written and spoken word was as exciting as ever, including speakers from across the literary spectrum. The Bishop's Stortford Picture Book Award was also presented to this year's winners. 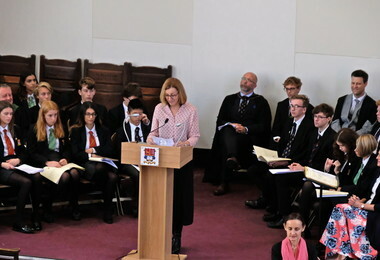 During Festival Week we launched our 150th Anniversary History of Bishop's Stortford College. Written by local author Gill Mullins and compiled by a team from the College, this hard backed edition will mark this wonderful occasion with a wide selection of photographs from the College Archives. Open to the public, this free lecture will discuss How Did We Arrive Where We Are? A Brief Analysis of the Last 150 Years. To find out more and to book your free ticket please click here. Brendan Simms will discuss The UK Post Brexit. To book your free ticket and for more information on the Ferguson Lecture Series, please click here. Jonathan Bartley will explore How Sustainable Ways of Life Will Change the Way We Live. To book your free ticket and for more information on the Ferguson Lecture Series, please click here. To book your free ticket to hear Sam Wells on the topic of What Will Influence our Moral Compass in a Secular Age? and to find out more about the Ferguson Lecture Series please click here. 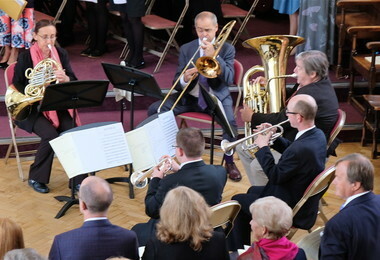 The combined choirs of pupils, parents, staff and friends of Bishop’s Stortford College come together with the College Brass Ensemble, percussion and organ to perform a special 150th Choral Concert. For tickets please click here. Simon Horobin will discuss the Future of English: Once a Powerful Tool in Communications, Diplomacy and Politics. To book your free ticket and to find out more about the Ferguson Lecture series, please click here. Tracey Follows will discuss The Future of Gender and will be introduced by Anna Hickey, COO of consulting firm Wavemaker. To book your free ticket and for more information, please click here. A series of special performances by the Pre-Prep and Prep School linked by a common theme and depicting life at the College over the years and possibly the future too.